Student loan forgiveness programs are indeed a blessing for those students who have to repay their student loans, even while struggling to make their ends meet. We are here to help you deal with the confusion in choosing the best student loan forgiveness programs by state. Like in the case of every other policy each state in the United States has a different approach while granting student-loan forgiveness. Several student loan forgiveness options include Public Service Loan Forgiveness, Federal Income-driven repayment plans, Pay as you earn (PAYE), Revised Pay as you Earn (REPAYE), Income-Based Repayment, Income Contingent Repayment Plan and more. Public Service Loan Repayment is for those who are committed to a public service career. There is no cap on the amount that can be forgiven. However only Federal Direct Loans and Federal Direct Consolidation Loans are eligible for this type of forgiveness. It is necessary to make 120 payments within 10 years while working full-time for any type of government. The forgiveness amount for this type of program is not taxable. The next type of forgiveness is Teacher Loan Forgiveness. Full-time teachers working in low-income schools are eligible for this type of program. An amount of up to $17,500 is eligible on direct subsidized and direct unsubsidized federal Stafford loan. Federal Direct Loan, Federal Direct Consolidation, and Federal Stafford Loans are eligible to obtain this type of forgiveness. The candidate must work full-time for five years. The forgiven amount is not taxable in this case. For teachers, other professionals, Americorps, VISTA, or Peace Corps Volunteers the forgiveness program that is available is the Perkins Loan Cancellation Program. Up to 100% of the loan balance can be forgiven in this case. The forgiveness program is for those who have taken the Federal Perkins Loan. If the application is based on the occupation, then the candidate has to work for four to seven years. The canceled amount is not taxable in this case. Forgiveness for Income Driven Plans is for the candidates enrolled in PAYE, REPAYE, IBR, and ICR. There is no restriction on the amount that can be sanctioned. Federal Direct loans, Federal Direct Consolidation Loans, and Federal Direct Plus Loans are eligible for this kind of forgiveness. After 20-25 years the remaining balance loan is forgiven. The amount that is forgiven is transferable. Loan forgiveness for Nurses is granted to the nurses working in a high-need area or military. Federal Direct Loans, Federal Direct Consolidation Loans, Federal Stafford Loans, Federal Direct Plus Loans are granted to the students. To receive forgiveness of up to 85%, the candidate must work in Critical Shortage Facility for three years. The forgiven amount is taxable, and the nurse corps will pay federal taxes to you. Doctors who make a commitment to work in a high-need area or in the military, are eligible to obtain loan forgiveness for doctors. The amount varies based on the program chosen. Similarly, there is loan forgiveness for lawyers. Military Student Loan Forgiveness is granted to those members of the military, who took their student loan debt before enlisting. For the army service, the amount granted is almost 100% and for the Navy Service, the amount granted is almost $65,000. The Air-force JAG Service also receives $65,000. Only federal student loans are eligible for this forgiveness program. The time for the service varies based on the service in which one is enlisted. Segal Americorps Education Award is granted to the Americorps Volunteers. The amount granted is almost $6,095. Federal Loans and Loans issued by state agencies are entitled to this type of forgiveness programs. The candidate should receive at least one term of service in this regard. The forgiven amount is taxable in this case. States across the United States of America has different student loan forgiveness programs, each catering to its own economy and workforce state. The state-wise characteristics and provisions of the student loan forgiveness programs are as given below. The student forgiveness programs for the Washington state has the following features. Residents of the state qualify for the student loan forgiveness programs. It focuses specifically on health professional loan repayment program. The amount is $35,000 for almost 2 years. Health care professionals are encouraged to serve in the state’s critical requirement areas. One major contributor to financial assistance is the loan repayment programs. Primary health care is imparted in rural as well as urban areas. The candidate should either be employed or should fall under an employment contract within the stipulated time. The candidate should be a US citizen. Employment should be offered at a site recognized by the state. A service contract for a minimum of two years should be granted to the candidate. Most jobs have different criteria while applying for student repayment programs. The loan forgiveness programs account to $35,000 of 50% of qualifying loan balance. The Oregon office of health has received site qualification. The amount offered can range up to $7500 for almost 3 years. This is a program to attract and retain public service lawyers. The eligibility criteria to obtain loan forgiveness is as given below. The candidate should have quality employment. The applicants must hold a license to practice in Oregon. If the applicant has a salary greater than $65,000 at the time of application, then he is not eligible to attain loan forgiveness. This program is particularly aimed at retaining high-quality providers who serve patients irrespective of their ability to pay. Dentists, Hygienists, Pharmacists, nurse practitioners and more are a few of the licensed professionals who are eligible to attain loan forgiveness. Unlicensed provider types of the Oregon forgiveness Program include Clinical Social Workers, Counseling or Clinical Psychologists, professional counselors, marriage and family counselors. A local health professional shortage area is an eligible practice site for licensed and unlicensed provider types. The loan amount varies based on courses in Idaho. The candidate should either be employed or hold an employment contract. Medicare, Medicaid, and health insurance programs should e accepted. The candidate should not hold concurrent service obligations. The candidate should agree for a site visit during his obligation period. Public Service Loan Forgiveness Program can be availed after 120 qualifying payments. Income Based Repayment Loans helps in repayment based on the income received. Such programs exist for a duration for 20-25 years, after which the loans will be forgiven. The state focuses on retaining health-care professionals, who are ready to serve in areas that lack proper health-care and medication. The loan forgiveness program of Nevada also varies based on courses. The candidate applying for loan repayment should agree on a full-time clinical practice at the Nevada Health Service Corps. Moreover, Teacher Loan forgiveness programs encourage individuals to choose and remain in the teaching profession. A list of teacher shortage areas is submitted to the Nevada Department of Education. Candidates can choose to teach in any of these areas in order to avail the loan forgiveness. The candidate must not also have any restriction on State Licensure. The Consumer Financial Protection Bureau states that there are 4.2 million student loan borrowers in California. If an individual work in the public service, then he can opt for a federal loan repayment program. Some of the loan repayment programs that can be considered include the following. California State Loan Repayment Program helps to repay qualified educational loans for certain primary health-care professionals. The amount granted would depend on if they are working full-time or half-time. In the case of Allied Health Care Loan Repayment Programs, the candidate should agree to practice direct full-time patient care, for a year. The loan repayments are available up to $16,000. The Bachelor of Science Nursing Loan Repayment Program is awarded up to $10,000. For primary Health Care providers, the state of California offers the County Medical Services Program Loan Repayment Program. Dental Student Loan Forgiveness Program offers several Student Loan debt forgiveness facilities. The most popular California loan forgiveness programs include Steven M. Thompson Physician Corps Loan Repayment, California State Loan Repayment Program, ad CDA Foundation Student Loan Repayment Grant. The candidate should be free of ay contractual obligation tools. The candidate should be committed to providing full-time direct patient care in an HPSA. The amount would range up to $50,000. Authorization of repayment of educational loans to health professionals is granted. The student loan forgiveness program amount varies based on courses and other criteria. The candidate should also engage in full-time clinical practice. moreover, the candidate should meet the licensure standards of the community. A few popular programs offering loan forgiveness programs are as given below. Joyce Holsey worked towards being a voice to thousands of people who couldn't raise their voices. The amount for the program can vary. The loan repayment programs were established to serve the legal needs of the poor. The foundation contributions are not left to Arizona graduates. A few of the popular programs that offer loan forgiveness include Health care professional loan repayment program and Veterinary loan repayment program. For both, the programs the candidate should hold licensure should be a citizen of united states and should agree to work full-time for the contract period. The person should agree to practice equality. The candidate should not hold a loan to be repaid. In case of breach of contract, the candidate should agree to repay the loan amount. Loan repayment is granted to veterinarians who practiced food animal medicine. If a candidate fails to meet the eligibility requirements throughout the course of the program, then they will sign a document in which they agree to pay the amount. The sponsor of the program is the Wyoming Office of Rural Health. Physicians are eligible for $40,000 in exchange for two years of full-time practice. Medical Professionals including nurse practitioners, physician assistants, certified nurse midwives, and mental health clinicians are eligible for a maximum of $20,000 at the National Health Service Corps Site. The US Department of Health and Human Services grants funds to the State’s committees to sponsor the forgiveness programs. The student-loan forgiveness programs of Montana include quality educator loan assistance program, rural physician incentive Montana, Montana institutional nursing program. To become eligible to apply for quality educators program, the candidate should hold a valid educator license, or should be an education cooperative, should be a part of Montana Youth Challenge Program, or a state youth correctional facility. He/ She must be a full-time educator. The educators who are part of this program must teach in a rural school district or should teach the economically impacted or undeserved. This can extend to those institutions that face greater educational challenges. For the Montana Rural Physician Incentive Program, the candidate must be a US citizen or legal resident. The candidate should hold a doctor of medicine or doctor of osteopathic medicine degree. He/she should hold licensure and should have existing eligible medical education loans along with full hospital privileges. To seek benefits from the Montana Institutional Nursing Incentive Program, the candidate must be a registered professional nurse and must submit proof of educational loan balance. Colorado student loan forgiveness programs include the Colorado Health Service Corps, University of Denver Sturm College of Law Loan Repayment Assistance Program and Colorado Law Loan Repayment Assistance Program. Colorado’s student forgiveness programs can grant an amount of up to $90,000. Colorado Health Service Corps is a generous program available to a wide variety of health professionals. After working in a health professional shortage area for three years, physicians and dentists can receive forgiveness of $90,000 if they work full-time for three years. They are eligible for only $45,000 if they work part-time. Physician Assistants, practical nurses, pharmacists, mental health providers and more receive $50,000 for full-time commitment and $25,000 for part-time commitment. One limitation of the student loan program at Colorado is that if the person has been in default for private student loans for six years or longer then the loans are categorized as time-barred. North Dakota Dental Loan Repayment Program. The amount granted ranges to a maximum of $80,000. Delta Dental Loan Repayment for Service Program is the Loan Forgiveness Program of South Dakota. The amount granted can grow to a maximum of $1,00,000. The graduates who work in STEM-Related occupations and meet the defined qualifications are offered opportunities in the STEM Occupations Student Loan Program. Nebraska Loan Forgiveness Program is available as the Nebraska Student Loan Repayment Program. The amount granted can be a maximum of up to $40,000. Teacher Loan Forgiveness for Perkin Loans and Early Childhood Educator Loan Forgiveness are the other Forgiveness Programs available under the package. Kansas Loan Forgiveness Program is available as Rural Opportunity Zones Student Loan Repayment Program, Kansas State Loan Repayment Program, and the Kansas Bridging Plan. Loan Repayment Programs can be opted by Medical Providers, Dental Providers, and Mental and Behavioral Health Providers. The physicians and dentists are eligible to receive up to $25,000 to repay outstanding educational debt. The other health professionals receive almost $20,000 annually. The program website holds all the information about the checklist, forms, and site-applications. National Health Service Corps Loan Repayment Program - This program enables America’s eligible medical practitioners to work for the underserved communities in the United States. The program also helps in building communities. Resident Physicians who are in Family Practise, General Internal Medicine, General Paediatrics, and Medicine/Paediatrics can make use of the Kansas Bridging Plan. Upon completion of residency training, the residents are encouraged to practice in a rural community. Nursing Education Loan Repayment Program grants incentive to nurses to start and/or continue to practice in those areas with less number of practitioners. Nursing Education Loan Repayment Program, helps in the recruitment and retention of professional nurses so as to recognize their interest to work in an underserved population. For a 2-year service commitment, the NELRP pays 60% of the applicant’s loan balance. Indian Health Service Health Centers, Native Hawaiian Health Centers, Public Hospitals, Migrant Health Centers, Community Health Centers, and Rural Health Clinics employ the NELRP Participants. Oklahoma Loan Forgiveness is available as Oklahoma Medical Loan Repayment Program, Oklahoma Dental Loan Repayment Program, and, Physician/Community Match Loan. To receive the full amount for physical education loan repayment program, the candidate has to be certified in any of the specialties such as Family Medicine, Internal Medicine, Paediatrics, Obstetrics, Gynaecology, Psychiatry, or Geriatry. For Mathematics and Science Scholars Loan Repayment Program the candidate should have completed a program in Math or Science with a cumulative GPA of 3.5 and should hold a contract to teach full-time in a classroom at a Title I School. Louisiana Bar Foundation Loan Repayment Assistance Program. To avail the state loan program the applicant must be a citizen of the United States, should have an unrestricted license to practice, should not have faced criminal conviction of felony act and should have verifiable student debt. Bar foundation loan assistance program provides loan assistance to those candidates who are ready to provide services to other underserved or vulnerable members of the community. Wisconsin Loan Forgiveness Program is available as Health Professions Loan Assistance Program. Health Professional’s loan assistance program is available to those in psychiatry, primary care, dental hygiene, dentistry and more. The candidates can receive an amount of $1,00,000 in education loan assistance in this case. Moreover, Physicians practicing in rural communities receive $50,000 in loan assistance funds. Physician Practitioners in Rural Communities receive $1,00,000. ‘Rural’ conditions are defined here as city, town or village with less than a population of 20,000. Federal Bureau defines it is an un-urbanized center. Another Loan Forgiveness Program known as the Indian Health Service Loan Repayment Program awards an amount up to $24,000. National Health Service Corps offers up to $50,000. Nursing Education Loan Repayment Program repays up to 60% of the qualifying loan balance. The program is based on loan assistance or repayment. To be a part of the Illinois Teachers Loan Repayment Program, the candidate has to be US citizen and also a resident of Illinois. The candidate should have a remaining balance on loans. The candidate should have completed a five-year teaching obligation, in an Illinois low-income Elementary or Secondary School and should also be a borrower whose educational loans are forgiven under the federal government’s loan forgiveness programs. The candidate should also have worked for full-time under a low-income child-care facility in Illinois. The John R Justice Student Loan Repayment Program is granted only to a US Citizen or legal resident. The candidate should have an outstanding balance on eligible loans and should be an attorney continually licensed to practice. The candidate should also be an employee of a non-profit organization. To avail the benefits of the Nurse Educator Loan Repayment Program, the candidate first has to be a US Citizen or legal resident in Illinois. The candidate should be a nurse educator in the Department of Financial and Professional Regulation. Veteran’s Home Nurse Loan Replacement Program grants an amount of $5,000 for a duration of 4 years. Mississippi Teacher Loan Repayment Program is the Loan Forgiveness Program for the Mississippi State. The program pays up to $3,000 for a maximum of four years per year of teaching in a critical geographical or subject area. To avail a Student Loan Forgiveness Program by the State of Mississippi the candidate should hold an Alternate Route Teaching License. The candidate should not have received fund from the Critical Needs Teacher Loan/Scholarship Program. The program pays up to $3,000 per year for a maximum of four years. Perkins loans and graduate level loans do not qualify for loan forgiveness through MTLR Program. To obtain the Kentucky State Loan Repayment Program, the candidate has to be a US Citizen, and should not have any other existing service commitment. The candidate should not be convicted of any felony and should not have any federal liens. The candidate should be employed by a dedicated health care professional shortage area site. Physicians, physician assistants, nurse practitioners, certified midwives, registered nurses, dentists, midwives, social workers, clinical counselors, health service psychologists, family therapists, psychiatric nurses, Counselors, Pharmacists, and similar professionals are eligible to apply for the State Loan Repayment Program. Student loan forgiveness is granted in Ohio state in programs including John R. Justice Loan Repayment Program, and, Ohio Dental Loan Repayment Program. To receive the John R Justice Repayment Program funding the candidate must be employed in the state. The candidate must be employed full-time and must bear a license to practice law. The Ohio Dental Loan Repayment Program, agree to provide care in those areas. The John R Justice Repayment Program offers an amount up to $1,054. The beneficiary should be employed in his/her respective JRJ funded state. The beneficiary should be licensed to practice law. The state of Florida has two major student-loan forgiveness programs including Nursing Student Loan Forgiveness Program and the Loan Repayment Assistance Program for Lawyers. To be a part of the nursing student loan forgiveness program, the candidate should be licensed as an LPN, RN or ARNP and should have loans incurred towards nursing education. Loan Repayment Assistance Programs for lawyers amounts to $5,000 per year and the nursing student loan forgiveness program amounts to $4,000 per year for 4 years. By teaching in a low-income school or educational service society consecutively for 5 years, it is possible to receive the Teacher Loan Forgiveness Program. Teachers who apply for the same should be highly qualified, in a way having a Bachelor’s degree or a full state Certification. Secondary teachers for Maths, Science and Special Education receive $17,500 as loan forgiveness. Other teachers receive almost $5,000. National Health Service Corps Loan Repayment Program, offers up to $50,000 for loan repayment. Primary health providers in health care, medicine, dentistry or mental health receive this type of loan repayment. Public Service Loan Forgiveness Program is beneficial for those who work for the government or non-profit agencies for 10 years. To be eligible to receive this forgiveness, one must have Federal Direct Loans, be enrolled in an income-driven repayment, work full time (at least for 30 hours per week), Make 120 monthly payments in full within 15 days of the due date. South Carolina Student Loan Forgiveness is available as Public Interest Law Loan Forgiveness Fund and to receive it the candidate should have passed from the USC School of Law. The amount granted varies. One program where student loan forgiveness happens in the State of Georgia is the Physicians for Rural Areas Assistance Program. The amount granted can range up to $25,000 yearly to a maximum of $1,00,000. North Carolina Student Loan Forgiveness is granted in programs including Forgivable education loans for service, North Carolina State Loan Repayment Program for Mental Health Professionals and NC Leaf Loan Assistance Repayment Program. North Carolina State Loan Repayment Program for Mental Health Professionals grants a maximum amount of $30,000 whereas the amount for others can vary. Forgivable Education Loans for Service is provided to those students who are committed to working in a critical shortage employment profession after college. The candidate must be enrolled in an eligible school and an approved program. An amount of $20,000 can be granted for forgivable loans and doctoral candidates can borrow up to $56,000. One year’s loan amount is forgiven for each year’s service. To receive benefits from the Virginia State Loan Repayment Program the candidates should either be citizens or nationals of the United States. The candidate should have completed residency training and should be Board Certified. The candidate shall not be under contractual service obligation and should not have any federal liens or judgments. The amount granted for the Virginia Loan Forgiveness Program varies and the LSC Loan Repayment Program Assistance Program amounts to $5,600 yearly for 3 years. Pennsylvania Primary Care Loan Repayment Program amounts up to $1,00,000 and the Pennsylvania Bar Foundation – PA IOLTA Board Loan Repayment Assistance Program offers a varying amount. The candidate must take part in Medicaid, Medicare and the Children’s Health Insurance Program. The candidate must be licensed to practice in Pennsylvania and must be employed by an LR approved state. Maryland Student Loan Forgiveness Program is granted as Maryland Smartbuy HomeBuyer Assistance and Forgiveness Programs. The amount ranges up to 15% of Home Purchase Price and includes a minimum of $1,000. Janet L. Hoffman Loan Assistance repayment program along with the Nancy Grasmick Teacher Award and the Maryland DentCare Loan Assistance Repayment Program are the various other Loan Forgiveness Programs of the Maryland State. New Jersey Loan Forgiveness Programs include John R. Justice Federal Student Loan Redemption Program, Primary Care Physician and Dentist Loan Redemption Program, and Nursing Faculty Loan Redemption Program are the loan forgiveness programs of the state. Steven C Krane Loan Assistance for the Public Interest Program. The State of Connecticut does not offer any Student Loan Forgiveness Programs. Massachusetts’s Loan Forgiveness Program is known as the Massachusetts Loan Repayment Program for Health Professionals. The state of Vermont also offers loan forgiveness programs. New Hampshire State Loan Replacement Programs can amount up to $75,000 whereas the New Hampshire Bar Foundation Loan Replacement Program amount can vary based on various factors. As in the case of the other loan replacement programs the applicants have to be Citizens of the United States and must agree to work full-time or part-time for the State of New Hampshire. Maine Bar Foundation Loan Repayment Assistance Program. Various professionals who are eligible for loan forgiveness include educators, graduate specialists with certification, Childcare providers and many more. Moreover, this forgiveness program is for those who work in the state. The state even offers loan credits to those who work in the state. This initiative is for meeting the workforce needs of the state which is currently unmet. The loan forgiveness program encouraged people to stay in the state even after they have completed their education so as to meet the workforce requirements of the state. As per the reports of the Consumer Financial Protection Bureau, nearly one-fourth of the American Workforce is eligible for repayment or, loan forgiveness programs. Though forgiveness programs are a relief, there are costs to be considered while choosing the forgiveness programs. Sometimes forgiven loans may be taxable, some other times forgiveness is not an option for defaulted loans. Consolidation or rehabilitation has to be used to get defaulted loans in good standing. If the loan hasn’t qualified for forgiveness, student loan forgiveness or bankruptcy can reduce the debt in severe cases. 1 - Which are the careers that qualify for student loan forgiveness program? Careers including Federal Agency Employee, Public Service Worker, Doctor, Physician, Lawyer, Automotive Professionals, Nurse, Teacher, Volunteer Organisation Workers and more help in obtaining student loan forgiveness easier and faster. 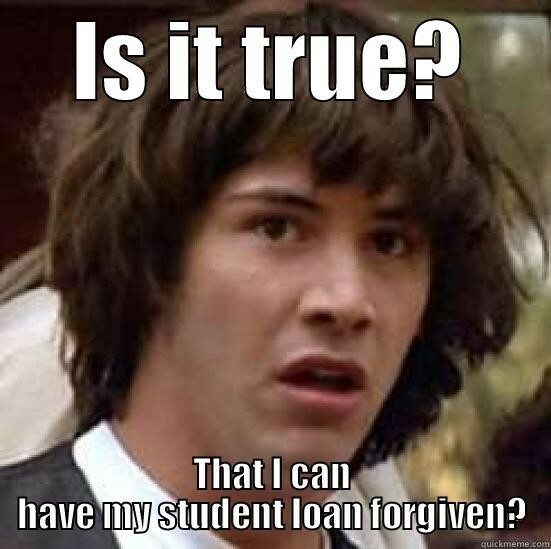 2 - How long does it take for the student loans to be forgiven? The pay As Your Earn Program helps in obtaining forgiveness after 20 years, whereas REPAYE and Income-Based Repayment Program offers repayment within 20-25 years of student loans. 3 - How is undue hardship proven? Meticulous records are submitted to prove that the undue hardship to receive the loan. 4 - Would someone be sent to jail for not paying student loan? 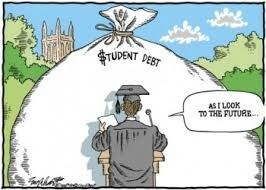 Noone would be jailed or punished for not having paid the student loan. Failure to pay the student loan, credit card, and hospital bill are categorized as civil debts. 5 - Would the loans be canceled if the borrower dies? Yes, the loans are canceled if the borrower dies. 6 - Which are the several repayment plans available for the borrowers to benefit? Several repayment plans including Income-Based Repayment, Pay As You Earn, Revised Pay As You Earn, Income Contingent Repayment, Public Service. Loan Forgiveness is available for students to make use of. The state of Maine offers the Opportunity Maine tax credit for college grads to live and work in the state. Kansas has sectors called the Rural Opportunity Zones, that help young graduates to deal with the debt burden. Moreover, cities including Hamilton, Grand County, and St. Clair County also offers programs that ease the debt. 8 - How to file for an undue hardship? 9 - Are student loan forgiveness programs the same for all the states? No. Each different state has its own unique student loan forgiveness programs. 10 - Which are the states that do not offer student loan forgiveness programs? Student loan forgiveness is not offered in states including Alabama, Connecticut, Tennesse, Utah, and Washington.